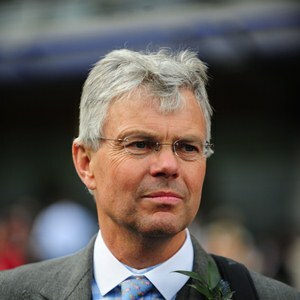 Eton-educated Hughie Morrison, who rode five point-to-point winners and served as a steward at Newbury, initially forged a career outside racing. After graduating with a degree in business studies, he worked for a healthcare group as well as pharmaceutical and lighting companies as an unusual grounding for a career in racing. “Anyone who has run a lighting business in Manchester in the depths of recession can cope with stress,” he said. The lure of horses saw him spend two years as assistant to Paul Cole before he bought Summerdown Stables at East Ilsley in Berkshire in September 1996 and began training the following spring. His first major success came over jumps at the 2002 Cheltenham Festival when Frenchman’s Creek, whom he also bred, won the William Hill Chase. He has enjoyed many big Flat successes, led by victories for Pastoral Pursuits and Sakhee’s Secret in the 2005 and 2007 Group 1 Darley July Cup at Newmarket. Other flagbearers include top stayer Alcazar, winner of the 2005 Group 1 Prix Royal Oak at Longchamp. He has trained briefly for The Queen and he has also trained for David Cameron’s mother Mary and the Duchess of Cambridge’s parents Mike and Carole Middleton, who part-owned the sprinter Sohraab. Morrison had a double at Royal Ascot in 2011 with Sagramor winning the Britannia Handicap and Pisco Sour, who had previously finished ninth behind Pour Moi in the Investec Derby, running out a comfortable winner of the Group 3 Tercentenary Stakes. Pisco Sour also annexed the Group 2 Prix Eugene Adam before being sold to Godolphin. He came very close to a first British Classic success when Shirocco Star was the neck runner-up in the 2012 Investec Oaks at Epsom Downs, in the Fillies & Mares category of the QIPCO British Champions Series. Shirocco Star also finished runner-up in the final Fillies & Mares race on QIPCO British Champions Day, when she found Irish raider, Sapphire, too strong.